Common Worship: Times and Seasons helps clergy and Readers plan and prepare worship that embraces the richness of the Christian year. This collection concentrates on the major liturgical cycles of the Christian year, especially from Advent to Candlemas and from Lent to Easter. It also includes a collection of resources for the festivals and seasons of the agricultural year, as well as material to explore themes like creation and the environment. This practical resource includes creative service outlines; fully worked out services for all the major festivals and a wealth of seasonally appropriate liturgical material e.g. introductions to the Peace, acclamations and blessings. Common Worship: Times and Seasons by The Liturgical Commission O England was published by Church House in April 2013 and is our 1686th best seller. 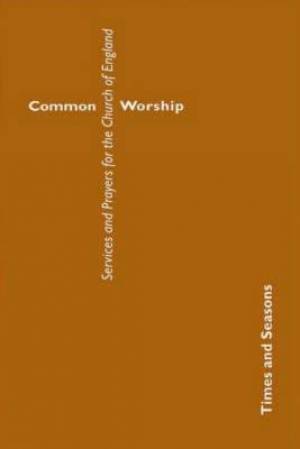 The ISBN for Common Worship: Times and Seasons is 9780715122631. Be the first to review Common Worship: Times and Seasons! Got a question? No problem! Just click here to ask us about Common Worship: Times and Seasons.